CEI provides assistance to draft EMC chapters for Environmental Impact Assessments reports. We have assisted many clients regarding emissions from High voltage powerlines including High Voltage DC. We have extensive experience of measuring harmonic emissions from power lines and verifying the immunity of local telephone circuits. Compliance Engineering International has an impressive track record in the energy sector, assisting and cooperating with energy clients including EDF, SSE, Airtricty, EirGrid, ESB, ESBI and Con Edison on interference and health and safety issues. The new EMF Directive presents its own unique challenges for the energy sector and as an accredited site EMF test service we provide reassurance to clients that is otherwise unavailable. We are also highly experienced and uniquely qualified to assist in harmonics and flicker issues. CEI assisted EirGrid to ensure compliance with electromagnetic compatibility and with EMF regulations of the East West Interconnector. The East West Interconnector is a 500 MW High Voltage Direct Current (HVDC) link between the electricity transmission grids of Ireland and Great Britain. 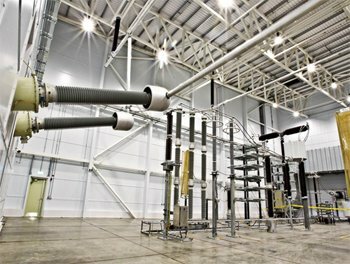 At 500 MW it is one of the largest voltage source conversion (VSC) HVDC links in operation worldwide.